Barclays Bank, the second oldest bank in Zambia, has closed five of its branches across the country. But the bank claims that the branches have not been closed but merged with others as part of digitalization of operations. Bank insiders however tell the Watchdog that the bank is feeling the impact of the general bad economy and bad policies of the PF which has made banks unprofitable. Branches that have been closed are UNZA, Kalomo, Chirundu, Chililabombwe and Kalulushi. 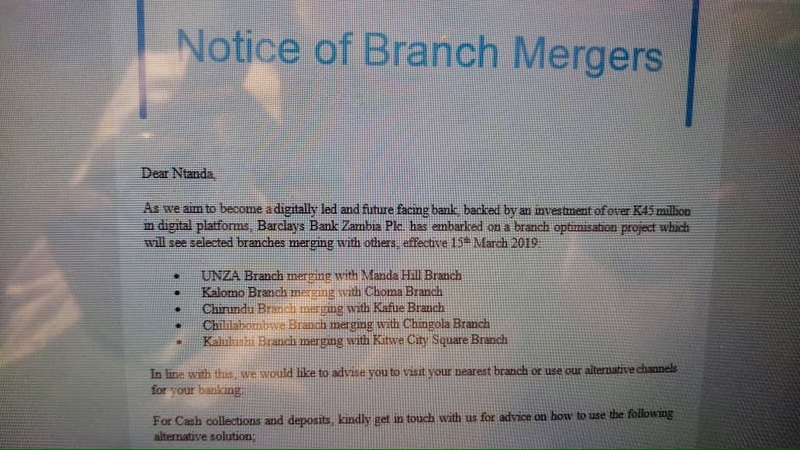 It means that clients in the affected branches like Chililabombwe, Kalomo will have to travel to other towns such as Choma, Chingola or use the Internet to utilize bank services. But why require people in peri urban areas to use digital platforms when they rarely access Internet? The branches were shut last Friday 15 March 2019.